Perform graceful shutdown for planned and unplanned Oracle RAC node outages. See Planned Outage Procedures and Unplanned Outages. Connections may be shut down periodically on AGL data sources. If the connections allocated to various Oracle RAC instances do not correspond to the Runtime Load Balancing percentages in the FAN load-balancing advisories, connections to overweight instances are destroyed and new connections opened. This process occurs every 30 seconds by default. Web applications have better performance when repeated operations against the same set of records are processed by the same Oracle RAC instance. Business applications such as online shopping and online banking are typical examples of this pattern. An AGL data source uses the Session Affinity policy to ensure all the data base operations for a web session, including transactions, are directed to the same Oracle RAC instance of an Oracle RAC cluster. XA transaction cannot span instances. "Overview of Automatic Workload Management with Dynamic Database Services" in Real Application Clusters Administration and Deployment Guide. "Create JDBC GridLink data sources" in the Oracle WebLogic Server Administration Console Online Help. The sample WLST script EXAMPLES_HOME\wl_server\examples\src\examples\wlst\online\jdbc_data_source_creation.py, where EXAMPLES_HOME represents the directory in which the WebLogic Server code examples are configured. This example creates a Generic data source. See "WLST Online Sample Scripts" in Understanding the WebLogic Scripting Tool. You can configure a data source so that it binds to the JNDI tree with a single or multiple names. You can use a multi-JNDI-named data source in place of legacy configurations that included multiple data sources that pointed to a single JDBC connection pool. For more information, see Developing JNDI Applications for Oracle WebLogic Server. Select the replay driver for Application Continuity, or the XA or non-XA Thin driver. For more information about Application Continuity, see Application Continuity. One-Phase Commit: (selected by default) With this option, a connection from the data source can be the only participant in the global transaction and the transaction is completed using a one-phase commit optimization. If more than one resource participates in the transaction, an exception is thrown when the transaction manager calls XAResource.prepare on the one-phase commit resource. For more information on configuring transaction support for a data source, see Chapter 12, "JDBC Data Source Transaction Options." Use one ADDRESS_LIST for each Oracle RAC cluster or DataGuard database. RETRY_COUNT is used to specify the number of times an ADDRESS list is traversed before the connection attempt is terminated. The default value is 0. When using SCAN listeners with FAILOVER=on, setting RETRY_COUNT to a value of 2 means that if you had 3 SCAN IP addresses, each would be traversed three times each, resulting in a total of nine connect attempts (3 * 3). You can also configure an ONS client using WLST. For an example, see Configuring an ONS Client Using WLST. To configure an ONS client from the Summary of Data Sources page in the Administration Console, see "Configure ONS client parameters" in Oracle WebLogic Server Administration Console Online Help. If you are using an Oracle 12c database with WebLogic Server Release 12.1.2 and higher, you are no longer required to provide the ONS Listener list as part of an AGL data source configuration. The ONS list is automatically provided from the database to the driver and you can see this information in the associated runtime MBean. However, if you want to use an associated Oracle wallet for ONS with SSL, the ONS listener list must be specified. maxconnections.id—Specifies the maximum number of concurrent connections maintained with the ONS servers. id specifies the node list to which this parameter applies. The default is 3.
active.id If true, the list is active and connections are automatically established to the configured number of ONS servers. If false, the list is inactive and is only be used as a fail over list in the event that no connections for an active list can be established. An inactive list can only serve as a fail over for one active list at a time, and once a single connection is re-established on the active list, the fail-over list reverts to being inactive. Note that only notifications published by the client after a list has failed over are sent to the fail over list. id specifies the node list to which this parameter applies. The default is true. remotetimeout —The timeout period, in milliseconds, for a connection to each remote server. If the remote server has not responded within this timeout period, the connection is closed. The default is 30 seconds. To communicate with ONS daemons using SSL, you must use an Oracle wallet file. To use a wallet file, in the ONS Wallet File Directory field, enter the directory of the Oracle wallet file in which the SSL certificates are stored. If required, the enter the wallet password in the ONS Wallet Password field. If you are updating an existing Active GridLink data source, you must update AGL configuration to include the wallet directory and password. See "Secure ONS Listener using Oracle Wallet" in Oracle WebLogic Server Administration Console Online Help. For more information on Oracle Wallet, see the Oracle Database Advanced Security Guide. To use Socket Direct Protocol (SDP), your database network must be configured to use Infiniband. SDP does not support SCAN addresses. See "Configuring SDP Support for InfiniBand Connections" in the Oracle Database Net Services Administrator's Guide. WebLogic Server provides several attributes that provide improved Data Source performance when using Oracle drivers, for more information, see Chapter 10, "Advanced Configurations for Oracle Drivers and Databases." For more information about configuring an ONS client, see ONS Client Configuration. By properly configuring the connection pool attributes in JDBC data sources in your WebLogic Server domain, you can improve application and system performance. For more information, see Chapter 20, "Tuning Data Source Connection Pools." For more information on JDBC monitoring, see Chapter 18, "Monitoring WebLogic JDBC Resources." The JDBCOracleDataSourceRuntimeMBean provides methods for getting the current state of the data source instance. The JDBCOracleDataSourceRuntimeMBean provides methods for getting the current state of the data source and for getting statistics about the data source, such as the average number of active connections, the current number of active connections, and the highest number of active connections. This MBean also has a child JDBCOracleDataSourceInstanceRuntimeMBean for each node that is active in the AGL data source.For more information, see "JDBCOracleDataSourceRuntimeMBean" in the MBean Reference for Oracle WebLogic Server. The JDBCOracleDataSourceInstanceRuntimeMBean provides methods for getting the current state of the data source instance. There an instance for each ONS listener that is active. In a configuration that uses auto-ONS where the administrator doesn't configure the ONS string, this is the only way to discover which ONS listeners are available. For more information, see "JDBCOracleDataSourceInstanceRuntimeMBean" in the MBean Reference for Oracle WebLogic Server. For more information, see "ONSDaemonRuntimeMBean" in the MBean Reference for Oracle WebLogic Server. You can activate WebLogic Server's debugging features to track down the specific problem within the application. DebugJDBCUCP—Traces low level Oracle RAC information from the UCP driver. You can enable UCP JDK logging by following the instructions in "Setting Up Logging in UCP" in Universal Connection Pool for JDBC Developer's Guide. Although not recommended, you can configure and use an AGL data source without enabling Fast Application Notification (FAN). In this configuration, disabling a connection to an Oracle RAC node occurs after two successive connection test failures. Connectivity is reestablished after a successful connection test. Oracle recommends that you enable TestConnectionsOnReserve. You might need to turn off FAN if a configured firewall doesn't allow this protocol to flow. In WebLogic Server 12.1.2 and higher, the ActiveGridlink attribute is used to explicitly declare a data source configuration as an AGL data source. It is automatically enabled by the WebLogic Server Administration Console when creating a GridLink data source. If you create data source configurations using WLST, you must remember to set ActiveGridlink=true. Legacy data source configurations are not updated during the upgrade process. If you need to update a legacy AGL data source to access Oracle RAC clusters without enabling Fast Application Notification (FAN), edit or use WLST to set ActiveGridlink=true in the configuration. Leverages all the advantages of HA configurations like DataGuard. For more information, see the Oracle White Paper "Oracle WebLogic Server and Highly Available Oracle Databases: Oracle Integrated Maximum Availability Solutions." Multi Data Source (MDS) for Oracle RAC connectivity has been supported in WebLogic Server since 2005. As the popularity of Oracle RAC has grown, so has the use of MDS. With the introduction of Active GridLink (AGL) in early 2011, many MDS users are migrating to AGL. Although there is no automated upgrade path, it is a simple manual process to implement AGL in your environment. See Comparing AGL and Multi Data Sources. The only changes necessary should be to your configuration. An AGL data source is composed of information from the MDS and the member Generic data sources combined into a single AGL descriptor. The only additional information that is needed is the configuration of Oracle Notification Service (ONS) on the Oracle RAC cluster. In many cases, the ONS information consists of the same host names as used in the MDS and the only additional information is the port number, and which can be simplified by the use of a SCAN address. Delete the Multi Data Source and the Generic data sources from the configuration using the WebLogic Server Administration Console. Give it the same JNDI name as the Multi Data Source. Set the user and password, it should be the same as what you had on the Multi Data Source members. There are many data source parameters that cannot be configured while creating a new data source. In most cases, you should be able to use the parameter setting used in the Multi Data Source. If there are conflicts, you will need to resolve them and select the appropriate settings for your environment. For more information on creating AGL data sources using the WebLogic Server Administration Console, see "Create JDBC GridLink data sources" in Oracle WebLogic Server Administration Console Online Help. For maintenance purposes (such as software and hardware upgrades, repairs, changes, migrations within and across systems), the services used are shutdown gracefully one or several at a time without disrupting the operations and availability of the WebLogic Server applications. Upon a FAN DOWN event, AGL drains sessions away from the instance(s) targeted for maintenance. It is necessary to stop non-singleton services running on the target database instance (assuming that they are still available on the remaining running instances) or relocate singleton services from the target instance to another instance. Once the services have drained, the instance is stopped with no application errors. 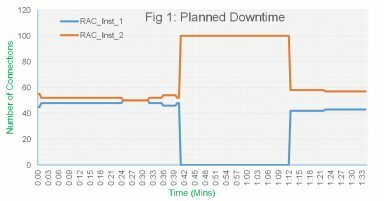 Figure 6-6 shows the distribution of connections for a service across two Oracle RAC instances before and after Planned Downtime. Notice that the connection workload moves from fifty-fifty across both instances to hundred-zero. In other words, RAC_INST_1 can be taken down for maintenance without any impact on the business operation.